In Simon's latest Science Adventure Story For Kids, you'll be imagining breathing in the smell of eucalyptus. 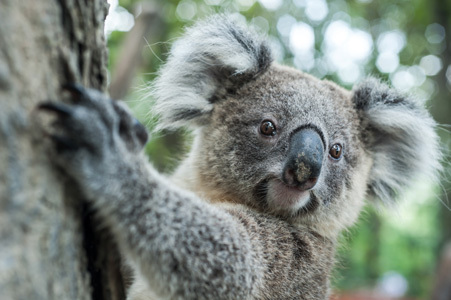 Queensland's eucalyptus forests are home to Australia's cutest and cuddliest marsupial, the Koala! Did you know Koalas can be seriously loud when they want to be, and quite territorial? If you want to do your own koala research online, then The Koala Foundation is a fantastic place to start. You can even Adopt A Koala there if you want to. If you feel like colouring in some Koala pictures, you'll get lots of free ones HERE. 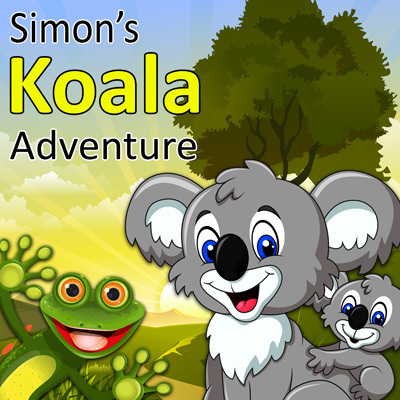 When your kids listen to Simon's Koala Adventure they won't just be entertained, they'll be learning too! Check out the amazing facts below about these fascinating animals! 20 things you may not know about Koalas! 2. The Koalas closet relative is the wombat. 5. Koala fingerprints are almost indistinguishable from a persons. 6. They have one of the smallest brain to body ratios of any mammal, about 40% of their cranial cavity is filled with fluid. 7. They're marsupials, not bears as their babies mature in a pouch. 8. They can pick the leaves with the least toxins and most water just by sniffing them. 9. They sleep 20 hours a day, 22 if they really feel like napping. 10. They only eat leaves that are attached to branches. Leaves on a plate would be a mystery to a Koala. 11. Their favourite Eucalyptus leaves are Manna Gum leaves. 12. They have 2 sets of vocal chords allowing them to make sounds 20 times lower than should be possible for their size. 13. They are mostly nocturnal. 14. They only drink water if they absolutely have to and will occasionally eat mud to get extra minerals. 15. Their teeth actually wear out over their lifetime. 16. There are 700 types of Eucalyptus leaf and Koalas will only eat 60 of them. 17. They will poo up to 150 times a day. 19. In 2006 thieves tried to steal a Koala from a zoo but found it too feisty and stole a crocodile instead! 20. Yes, they do smell like a big fuzzy cough sweet. 1. In Western Australia, gum trees have been found with gold in their leaves, drawn up by their roots when they were looking for water. 2. Eucalyptus trees actually originate from Patagonia, way back when the land masses were still connected. 3. Eucalypts need bush fires to help them regenerate. If there is no fire for around 600 years, they will die out and be replaced by rainforest. 5. They are currently trying to work out how to make aviation fuel for Jets out of Eucalyptus oil.